A bid to register the shape of a four-finger KitKat as a trademark was given the thumbs down by a High Court judge. 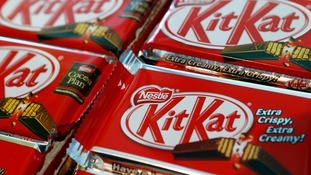 KitKat's company Nestle say they plan to appeal the decision after Mr Justice Arnold rejected the application on Wednesday after rival Cadbury objected. Nestle said the shape was "iconic" and deserved protection but after considering issues relating to the "distinctive character" of the chocolate snack, the judge ruled against the company. The ruling means that competing companies cannot use the brand name but could produce similar-shaped chocolate bars. Lawyer Georgie Collins, who specialises in intellectual property at Irwin Mitchell, said: "In the highly competitive arena of consumer goods, the shape of a product can be a market differentiator and a way of distinguishing your product from that of another brand. "In this case, 90% of survey respondents mentioned the KitKat brand when shown a picture of a four-fingered chocolate bar, but this was not enough to grant Nestle a monopoly over the four-finger shape." Sharon Daboul, a trademark specialist at EIP law firm, said it was a "common sense decision". Allowing registration of the KitKat shape would have given Nestle a valuable monopoly and competitive advantage. Cadbury bosses said they were pleased with the ruling but would not say whether the company had plans to produce a four-finger chocolate bar. A spokeswoman added: "(It) is in line with our contention that the shape of the KitKat bar is not distinctive enough to be protected as a trademark." Cadbury and Nestle have already been embroiled in a trademark dispute over the use of a particular shade of purple. Four years ago, a High Court judge ruled in favour of Cadbury after bosses applied to register a purple chocolate wrapper as a trademark. But in 2013, the Court of Appeal overturned the High Court decision ruling that Cadbury did not comply with requirements for its registration.